If you watched any of the trailers, TERMINATOR: GENISYS’s marketing campaign spent a lot of time spoiling crucial plot points. They even got James Cameron himself to give his Godfather’s blessing to the new movie, and Arnold’s always been a workhorse when it comes to selling his films. I’ve been a Schwarzenegger fan since I was a kid, seeing CONAN THE BARBARIAN for the first time. I’m always rooting for him to succeed. I imagine it’s a lot like my dad seeing everything John Wayne ever did, even when Wayne advanced in years and he was no longer the box office draw he once was. There’s a brand loyalty there that’s difficult to shake, so it definitely makes me wince a little bit to say that TERMINATOR: GENISYS is a terrible movie, full of bluster and nonsense. Don't be mad at the TERMINATOR: GENISYS trailers giving too much plot away. Instead, appreciate how the ad campaign actually warned you of the film’s awfulness ahead of time. GENISYS, like JURASSIC WORLD, rides in on waves of nostalgia, and that may be enough for audiences. But whatever you may think of James Cameron, he knew not to overstuff his two TERMINATOR films with more plot and action than they needed. The first TERMINATOR is tight as a drum, and the second matches its spectacle with a big heart worn prominently on the sleeve. They work because they never try to be above the audience, while at the same time giving the audience lots to think about and chew upon. These are films with Arnold Schwarzenegger at the height of his action hero powers, and Cameron wisely directs Arnold to his strengths. Alan Taylor is certainly no James Cameron, and more than anything, I just felt bad for Arnold, mugging for the camera and used as a running joke for much of GENISYS’s running time. He deserved better than this script, which has to be one of the worst scripts in a very long time. These aren’t mere plot holes – these are plot singularities, sucking in all logic, theme, and character until nothing can escape. Even now, I’m still trying to piece it together. Alternate timelines, the motivations of certain characters, even the T-800’s backstory makes no sense. Time travel movies normally orchestrate their plots with a little more finesse than this. The nonsensical plot makes it impossible to care what happens to Sarah Connor (Emilia Clarke), Kyle Reese (Jai Courtney), or John Connor (Jason Clarke). There are no stakes, because we’re constantly reminded that what happens is inevitable, and even when we’re told that certain events have changed the timeline, they change right back. The movie so desperately wants to be ranked with the first two that it even recreates much of the first act of the first TERMINATOR, but it does it simply for the nostalgic reminder to the audience. It doesn’t mean anything. Sure, watching an Arnold on Arnold fight looks fun, but the filmmakers are desperately hoping that you don’t figure out that the scene makes no goddamn sense. It shouldn’t even exist. In fact, much of the film’s plot would collapse on itself with a little syllogism. We’re constantly reminded of Kyle and Sarah’s great love, but if any of the writers ever thought it through, why not simply shoot Kyle and cause all these alternate timelines to cease to exist? Where does Sarah’s T-800 come from anyway? Who programmed it and why? Does Skynet exist outside time, simply willing itself into existence? Who knows? There may be an interesting idea or two in GENISYS, but it’s buried under cacophony and distraction. The action sequences are good, but, again, they don’t mean anything. Again, there are no stakes, and thus everything is simply interesting to look at but has no emotional or dramatic point. Arnold gives as much as he can, but each sequence feels inert. The story arc of John Connor is especially egregious, and feels like a plot point that the filmmakers wanted to anchor the film around as some kind of twist for the audience. But the twist doesn’t work, because the filmmakers don’t allow us to get invested. This is a singularly bad script, and writers Patrick Lussier and Laeta Kalogridis cannot bring together each plot strand to form a coherent whole. TERMINATOR: GENISYS is likely the last of this franchise, and that’s a blessing. It means that Arnold Schwarzenegger can move on to the next stage of his career, whatever that may be, and I hope for the best for him, and I’ll always be a fan. If he picks roles that challenge him in his older years, all the better – although SABOTAGE isn’t a great movie, Arnold is actually quite good in it, and I think there’s a script out there that will absolutely give him the great role he deserves, playing to his abilities and reminding us all why we worshipped this guy in the 1980s and 1990s. 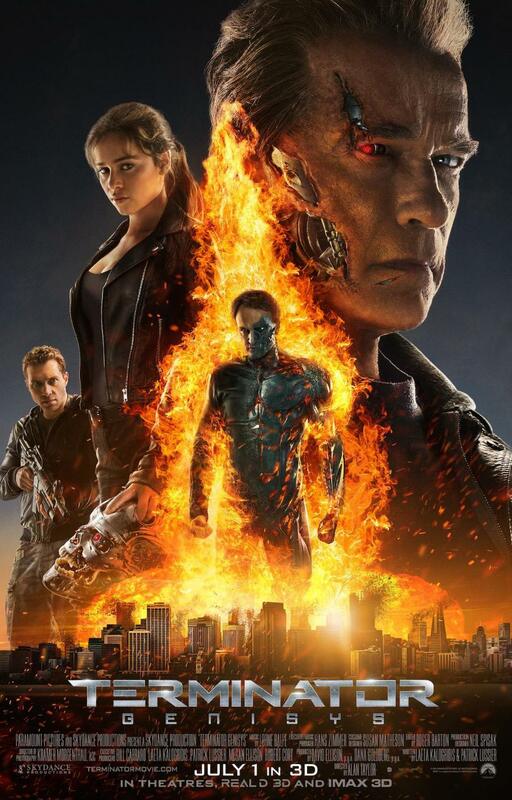 TERMINATOR: GENISYS is a waste of talent and money. Don’t be back.